I've only recently started to run Google AdSense ads on Digital Alchemy, but have already seen how sensitive clickthroughs are to placement, color, background, and other simple factors. Here are three tips you can get started with immediately to jump start your AdSense earnings. Make sure to place your AdSense units near rich content areas on your webpage and above the fold if possible. "Above the fold" means the area of the screen that you don't have to scroll to see. 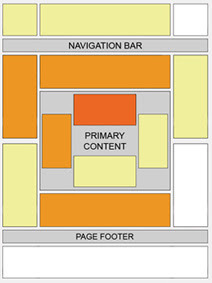 Take a look at the heatmap to the right for an idea of where the strongest performing areas of a typical webpage are. The darker orange areas perform best. But you'll want to balance increasing CTR with the appearance of your site. Don't let Google guess what content is important on your website. AdSense is a contextual advertising platform, which means Google tries to figure out what you're writing about and displays ads based on that. Section targeting will tell Google which areas of your blog it should focus on in deciding what kind of ads to show your readers. Readers will be more likely to click on ads that are relevant to what they are reading. You'll want to section target your main blog content and tell Google to ignore parts of your blog like the sidebar, header, footer, and other less relevant content. Split testing is one of the most powerful ways to find strong performing ads. At its simplest, you will rotate two different ads in the same position on your webpage that only differ by one attribute. What is an attribute? It could be the color of the ad title, the size of the ad unit, or the background color of the ad. All of these will make a difference in how readers respond to an ad. It's important to test only one difference at a time and get enough click and impression data to make a statistically sound judgment (Which ad performed better?). You'll want to replace "//your first ad unit code goes here" with your first ad code and "//your second ad unit code goes here" with your second code. Only use the part of the ad code between the <script></script> tags, not the whole thing. Get further information about the importance of A/B testing here. Now you have three different strategies to more precisely target your AdSense ads to your blog content and increase clickthroughs. In future posts, I'll look at how other successful blogs and websites are using AdSense to effectively boost their online earnings. Note: you'll notice that AdSense units on Digital Alchemy are placed in precisely the wrong area according to what I've told you. Well, for one thing, it's always good to test traditional assumptions about ad placement. For another, aggressive ad placement can degrade reader experience. Always try to balance CTR and design aesthetics. thanks for the great advice. I'm a adsense begiiner and have been looking for ways to increase my earnings. Looking forward to more of these posts on AdSense optimization. Stay tuned! I'm working on a post that will help you figure out optimal placement of AdSense ads. AdSense Paster looks like a much cleaner way to implement ad rotation. Too bad it doesn't work for Blogger! WHY?! I did all things correctly, im pretty sure of that.